Have you played with IMAGES in Flutter? If not, this article is the right destination for you. I have worked out a demo to explore various blending options that can be applied to any image in Flutter. 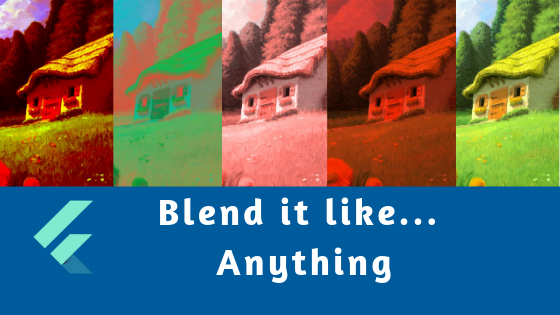 Blending modes available in Flutter — Color Burn, Color Dodge, Saturation, Hue, Soft Light, Overlay, Multiply, Luminosity, Plus, Exclusion, Hard Light, Lighten, Darken, Screen, Modulate, Difference. Each of the options has two properties color and colorBlendMode. For the sake of demo, I have created a map of selected blend modes that I found are working for images directly in Flutter. Image is loaded from assets. Stack having two children. Image and a List container. When a list item is selected, the widget is rebuilt and respective blend mode is applied to the image. selectedBlendModeIndex is updated in setState when an item is selected. Blend mode lying on that index in the blendModeMap is applied to image. While I was creating a demo, I needed some type of selectable list view. I came across ChoiceChips, which actually have two useful properties selected and onSelected . onSelected is called when a tap operation is performed on ChoiceChip. If the chip is selected, selectedBlendModeIndex value is changed to the index of the selected item from the list. To highlight the selected item from others, I have changed the fontWeight and fontSize of ChoiceChip label . selected is a bool value, which holds true if the current chip is the selected chip out of all the ChoiceChips in the List. That is the end of this article. If you liked the article, hit the clap and follow me for more articles on Flutter. Comment for any questions or feedback.